THIS in our main bathroom! A fashionable skirt for my nekkid bathroom vanity. A bit of leftover fabric from my dear sweet friend, Richella...some trim, hot glue, and few staples...and there you go. Wham-bam-thank-you-ma'am! And now I am off to finish painting the other bathroom. Yes...I am aware it is midnight, but that's when I get my best work done! Oh, and did I forget to mention that I'm hosting our annual Halloween bash for about 40-50 people here tomorrow night??? I'm midway through a bedroom/bathroom makeover, my house is a disaster, and I'm considering painting my front door before the party tomorrow night. Isn't this the most divine room on the planet? If I could have my dream room, this would definitely be it. 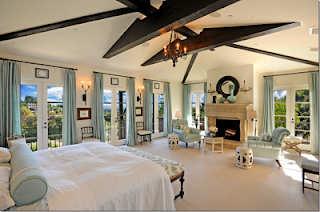 I love the soothing colors, all the yummy soft draperies, the bedding, and the gorgeous exposed beams. It looks like the perfect place to relax and unwind. And so... I am using it as my inspiration while redoing our master bedroom/bathroom on a non-existent budget. Needless to say, mine will not be quite as luxurious, but I will do my darnedest to get close. I have lived with a disgusting excuse for a bedroom since we bought this house 3 years ago. I've allowed it to become the dumping ground for everybody's stuff, and all those things we just don't have a place to put. Bottom line...it was a cluttered, nasty, hot mess! There are so many "issues" with this room I felt overwhelmed and didn't know where to start. So I did nothing. And I was completely miserable...hated going in there. That door is the first one I close when the doorbell rings. I'm ashamed of it. But no more. I am putting my foot down, and hard! I.Need.A.Happy.Place. 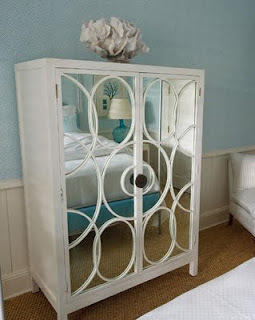 This mirrored chest is another one of my inspiration photos. Hello gorgeous. I don't care if it's only a pencil cup...I will have something mirrored in my room! 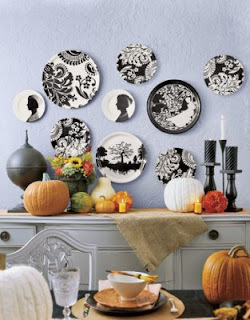 And a wall full of beautiful black and white plates. 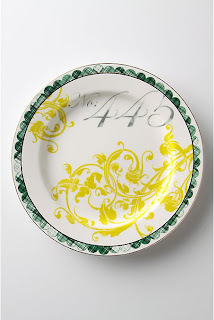 I already have big plans to make my own silhouette plates...I can hardly wait! I have never been a ruffle girl, but these pillows make me swoon. They will be gorgeous with my all white bedding. I get all vehklempt just thinking about it! 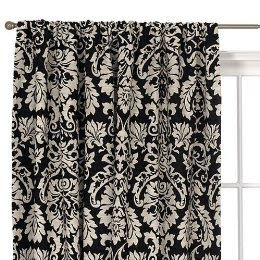 I scored on these drapes a couple months back at Target. I found two of these gorgeous panels randomly left in the rubbermaid aisle. They were originally $39.99 each, but marked down to $8.74... I felt giddy. I've been collecting accessories and such at yard sales and clearance sales for several months in anticipation of my room redo. I am so ashamed to show these pics, but I feel I must. You need to know how terrible this room was. This is one of the bathrooms where the previous owners applied a not so lovely venetian plaster...gone horrible wrong! Did you notice I said one of the bathrooms??? Yes ma'am, apparently they liked it so much, they did it to both bathrooms. I'm pretty sure they were legally blind. Oh heavenly days...the close up makes me want to puke. And sadly, it is even fuglier in person. If they weren't blind, they must have been toasted and wearing blindfolds. This stuff is so thick in some places, it's ridiculous. It sticks way out from the wall... I'm surprised it hasn't put someone's eye out. Oh, and the color...let's not talk about the muddy brown dirt shade that it is. I forgot to take a before picture of the room, because I was chomping at the bit to start painting. I chose white. I know what you're thinking... snooze fest. But white is exactly what I wanted. Soothing, simple, clean, and calm. All the things that this room was not! This is an "in the process of" picture. Just imagine an exercise bike and 5 black garbage bags full of crap sitting there too. Shameful. It is getting closer and closer to being pretty. Just painting the walls made a huge difference. Before, I felt like I couldn't breathe when I walked into my room. That's not a good feeling for a master bedroom. It should be a retreat. And it is well on it's way to being just that. I will keep y'all updated on the transformation. Mad for Plaid...and Cute Hats! 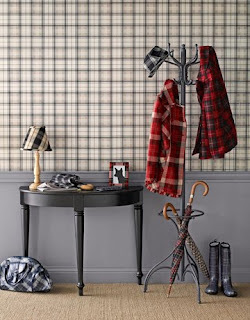 The November issue of Country Living had a whole spread on plaid. And I LOVE plaid, so I was thrilled! Decorating with plaid, wearing plaid, eating off of plaid, wiping your dishpan hands on plaid, accessorizing your furniture with plaid...6 beautiful pages full of lovely. I might be one of those old school girls who never stopped liking plaid, even when it wasn't cool. Well, now it's cool again. Apparently, it's hot this season...it's everywhere. From the ultra fab pages of Anthropologie to the cute and cost efficient aisles of Target. I died and went to heaven when I saw this absolutely gorgeous belted jacket. Oh, and I'll take that model body to go with it...thankyouverymuch! I am loving this rosette necklace! I found a tutorial on how to make these, but I doubt mine would look so amazing. I.Want.That.Necklace. Yes, this is a bit much...even for a plaid lover like me. What drew me in was that fabulous bag sitting on the floor in the left hand corner of the picture. Adore! 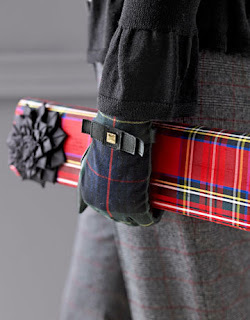 On the other hand, this gargantuan clutch that is ridiculously long and 147% impractical...I could do without! But I'll take the gloves, and the pants, and the sweater. 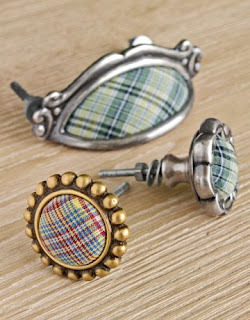 These drawer pulls from Anthropologie are too stinkin cute. 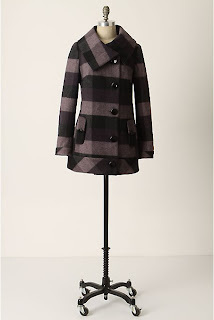 Anthro jacket....beautiful and ridiculously overpriced. 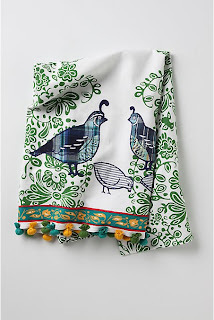 The quails on this dishtowel have plaid bodies...how cute is that? The scalloped edge on these dishes are actually plaid. Divine. What can I say? 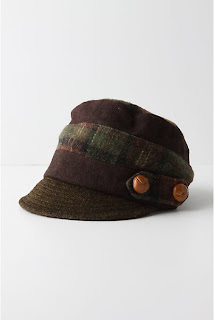 This hat is adorable. And I think it would compliment my new red hair just right. Oh...didn't I mention that I went from blonde to red??? Many people think I'm crazy, out of mind for doing it, but I love it! Sorry my cute new hat covers up most of my hair, so it's hard to see the full color. That's what you get when you haven't washed your hair and you have to actually get dressed and leave the house. Believe me...this is much better than me in greasy hair and pj's. I'm doing you a favor. Ok, I am so super excited about my new rug. It was a major impulse buy, and I LOVE it! I have admired zebra print rugs in magazines and brave homes for a long time. Well, I finally got the courage to try one in my modest little home. I think it adds just the right amount of personality and pizazz to a space that sometimes seems very boring and predictable to me, sans the chocolate brown walls! And with a touch of aqua blue...yummy. I love the way it looks with my giant black armoire and dropcloth tableskirt. Now I'm on a mission to find or make (hot glue) some cute pillows in a fun fabric. I'm thinking big aqua blue and white polka dots. Any suggestions? My husband is worried that it looks too busy, but I like this room's eclectic feel. Modern mixed with traditional mixed with yard sale treasures. The perfect brew of my self-proclaimed style... "Funky Traditional". And just so you can rest assured that I like to keep it real...this picture for your viewing pleasure. As you can plainly see this was not staged in any way, shape, or form....several piles of folded laundry, dolls, toys, books, and more. I live in a real house with 6 real people who make real messes ALL.DAY.LONG. And I was way too tired to clean it up...even for you, my friends. So this is what you get...a big ol' dose of my reality! If anyone is in the market for a new rug, Overstock.Com has some amazing deals. The shipping for your entire order is always $2.95....gasp. But if you have a Paypal account, the shipping is FREE. They have great customer service, wonderful reviews on most products, helpful tips on keeping your rug clean, and a vast array of products to choose from. Man, it sounds like I'm being paid to endorse them...but sadly, I am not. I just wanted to share my deal with you all. Oh, and did I mention that this rug is thick and plush and wool? I'm not sure I have mentioned before my undying love for spray paint...really any kind of paint. It is amazing what a difference this small can of magic can make! See that picture of my fridge below? I used it for a post about clutter. Not until I posted it did I notice how horrible the handles of my fridge looked. I knew they were yellowing, but I guess I was in denial about how bad they really were. It's been one of those little projects that's been on the list for a while, just not top priority. Well, my hubby actually pointed out how bad they looked this weekend. When your husband notices something like that...you know it's bad! Lucky for me he thought it was imperative that those handles be painted ASAP, so he took it on as his little project. Yippeee...one less thing I have to do! Ahhhhhhhh.....that is so much better. Be sure you buy paint made specially for plastic. Just don't buy this paint...it is horrible! We made do because they were out of the Krylon Fusion in white, but I wouldn't recommend doing that. Wait for it to be restocked...it's worth it! Quality paint = quality work. Oh, I cannot even tell you how happy those white handles make me. What a huge difference a bit of paint can make. What have you painted lately that made you smile? Thanks to Jenny and Megan for doing all the work for me! And I'd love to see your webs if anyone would like to share theirs when they're finished. It's a Freaky Friday Blog Swap! I have swapped blogs with my friend Becca from Blue Cricket Design for the day. Becca describes Freaky Friday as... "a chance for us to meet other totally awesome, amazing, awe inspiring, cool creators. We switch blogs for the day and introduce ourselves to each other's audience. What a great way to link creative communities!" Yes indeedy. Thank you Becca for inviting me to participate in your Freaky Friday blog swap. I hope y'all will show my new friend some bloggy love. Hi there! I'm Becca from over at Blue Cricket Design! I am so happy to be on this mini blog vacation and visiting with all of you! I am a huge fan of Amanda and all her many talents! I am excited to share with you a fun Halloween project I hope all of you will enjoy! One of my roommates in College has a wonderful family tradition! After Trick or Treating her kids leave their Halloween candy on the front porch and "Magically" it turns into a prize in the morning! I fell in love with the idea!!! I can't stand all the candy after the holiday! There is just too much! So I am adding to this fun tradition and I have created a "Magic Halloween Bag" to put the candy in! You could also simply make this bag for Trick or Treating! It beats the Pillow case I always used as a kid! They are just so darling!!! Cut each print in strips the width of the fabric. Vary your strip size for a fun random look. 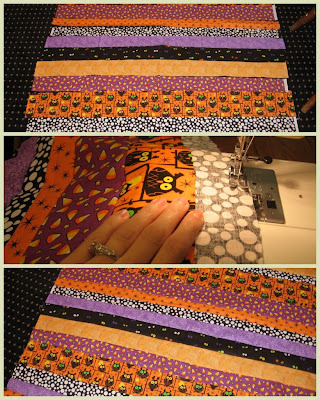 Lay your cut strips out alternating the colors and prints and create your pattern. 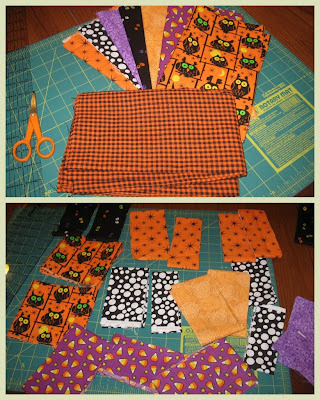 Start sewing the strips together until they are all sewn together! Press this finished section with an Iron. 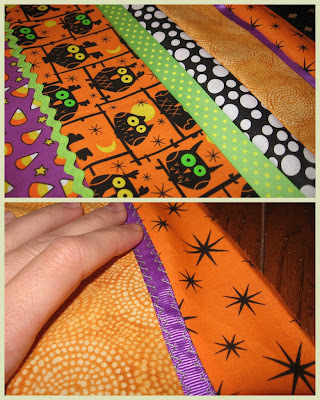 I used Ric Rack and other ribbon and added then throughout the strips. I sewed mine on with a zig zag stitch! Now we are going to sew the finished section onto the lining of the bag. Be sure to place the striped section face down onto the lining fabric and pin it in place. Sew the fabrics together leaving a small opening where you will then turn the bag right side out! Press again with an Iron. Adding the drawstring is easy! Lay a piece of ribbon that is longer then the width of the bag onto the top of the bag. Fold over an inch of fabric and pin in place! 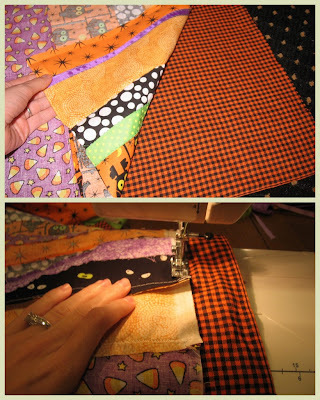 Sew a straight stitch to encase the ribbon. 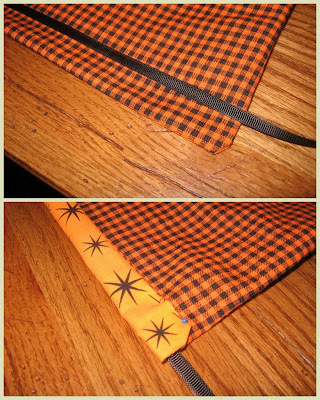 Fold the bag in half with the stripes on the inside and sew the sides together leaving the top open. Be careful not to sew the drawstring closed. Turn it right side out and there you go!!! I made up a Poem to go along with our new family tradition of trading in our candy! I will print it out on fun Halloween Paper and laminate it and then attach it to the drawstring. It's always fun to Trick or Treat! With lots of yummy things to eat! Handfuls from a candy dish! But all that candy can't be great! It might give you a tummy ache. This magic bag has a surprise! It turns your candy into a PRIZE! Thanks for letting me share! I would love for you to come and see all the other fun ideas I share on my creative blog! Blue Cricket Design is my collection of craft projects, recipes, tutorials, giveaways and more!! !Come back often and join in on the fun!!! Here are 2 great links for those of you interested in making some big 'ol webs. Thanks to Jenny and Megan for providing them! Ok, sorry for the shameless reference to a bad 90's song! It just seemed perfect for my title. But now I can't get it out of my head. Oh well... that's what I get, right? My sister Jenny came up with this fabulous creation for her porch. Isn't it just the absolute coolest? She knew I would be the only crazy person who would get excited about a ginormous spiderweb, so of course she called me to come and see it immediately. And of course, I rushed right over. This is what she used to make it. Oh, and a staple gun. And a ladder and a super sweet sister to be her assistant! I wish I could give you this wonderful tutorial with step by step instructions...but I have no clue how she did it. And I was there and helped make 3 of them. Yes...I'm good like that. I do know that she started with a base by making an "X" or a "T". Then started from the center tying rope knots all the way around. If you can't tell, we were seriously risking life and limb to put this thing up. But it was so worth it. Aren't they the coolest??? She has since done two more and I need to go back and take a final picture. She said she's never decorated for Halloween before. I think she's hooked now. If I can get the link for how to make these ultra cool spiderwebs, I will come back and add it to this post tonight. If not...you're on your own. Get those creative juices flowing and have fun! Cricut, Cricut...Who Got a New Cricut??? So many of you have asked about the cartridge I used to make my new signs. It is called "Home Decor" and I got it off e-bay for about $20 (brand new). I have found that you can get the best deals on cartridges as well as the machine on e-bay...that's where I got mine. I only have the 2 standard cartridges that come with the Cricut (Plantin Schoolbook & Accent Essentials) and the Home Decor one. For now that is all that I plan to purchase. I really don't have much of a need for a lot of cartridges, plus that can get expensive real fast. And I know plenty of people I can borrow or share cartridges with. Y'all know I'm too thrifty for all that! Oh, and there is also a program you can buy called "Sure Cuts Alot". 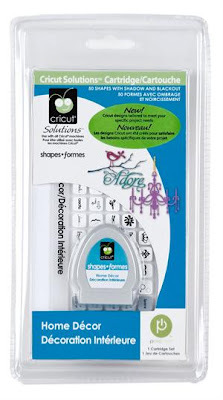 It allows you to hook the cricut to your computer and use any true type font you already have. Now that is awesome. Maybe one day. I also included a picture of the graphics that come on the Home Decor cartridge. Just click on the picture to enlarge it. 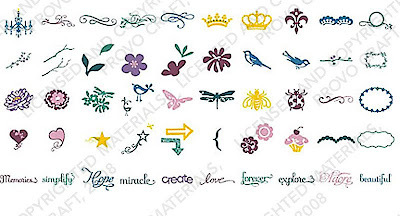 I'm sure most of you die hard crafters know about the Cricut (pronounced..."cricket") and probably have owned one for ages. I, on the other hand, have only drooled over theses fancy machines..thinking I'd never have one of my own. My sweet sweet sister let me borrow hers for a couple months and I got completely hooked. But I'm proud to say that I sold enough of my etsy wares to buy my very own . Whoo-hoo! Seriously, that may not sound too exciting to you, but to me it means so much. It means I am finally doing what I love, what I am passionate about. It means I've put myself out there for the world to see and come to find out...it's not as scary as I thought! It means I am feeding and cultivating and nourishing my creative spirit. And let me tell you...that feels soooooooo good! I don't plan or expect to make a living selling crafts, but it is so nice to feel a sense of accomplishment and fulfillment doing something that I LOVE. Ok...sappy mushy moment over. Now I will gush about the wonderfullness of my new toy! I am amazed at how detailed and intricate this machine cuts. And to top it all off, it is super easy and user friendly. I am no techie...I NEED easy. For reals! All I did was snap in the cartridge, type the chandelier button, set the size for 3 inches, and the quantity I want, load the paper...and VOILA! A whole stinkin page full of teeny tiny beautifully detailed chandeliers. I love this thing. Not only does it cut paper, it also cuts chipboard, vinyl, and much more. The possibilities are endless. I have probably used about 1/100th of it's full potential, which is crazy, and I would be happy with that...but it can do so much more. I can't wait to see what we come up with together. Me and my new bff. My other sister ordered a Halloween sign for her back door. She wanted spooky, but chic. Ummm...hello? She asked...Cricut and I delivered! But let's be honest here. Her back door is like the Taj Mahal of doors (I take pictures of all my signs at her house for this very reason). I could hang a little pile of dried up poo and it would look fabulous. Regardless, I'm glad we went with the cute sign and not the poo. I don't know... I'm just sayin.